Pertains to politics and governance, rights of citizens. Viral email messages, a stealth tool in political motivation, abound during political campaigns. I collect them as samples of propaganda because they are so blatant that they make good examples when I want to talk about critical thinking. The same propaganda techniques are widely used in popular media, especially MSN and Fox News — they are just more nuanced. So in this post I wanted to deconstruct a viral email that is circulating among conservatives. I have redacted the email names but othewise what you see is what I pulled from my gmail inbox. Click the image to view the actual PDF file. I have added notes which you can point to and read and I’ve highlighted certain words and phrases that triggered my skepticism. My aim is to show readers how easy it is to spot inauthentic information, and deliberate dis-information if you train your eye. The first thing you will notice about the item is the very large font and the use of red type. The sender uses all-caps in the subject and the phrase “a must read”. So from the outset, there’s lots of hype; and that’s often a signal that it’s not credible. The body text repeats both the words and the emphasis and tells us that the author is a very important, educated, and credible source … at least if you are a fan of conservative opinion. But the adjectives are too over blown and the sender’s evident need to promote the author triggers my skepticism. Reading further, the use of common clichés leads me to suspect that this writing is not the work of a high profile PhD affiliated with a scholarly think-tank like Heritage Foundation. The overuse of absolutes like “all”, and “never” begs credibility as well. The further down the page you get, the more the language sounds like a rant. The writer uses certain phrases as if they were well accepted and shared by the reader. Among like-minded people already wedded to his point of view, those phrases would have special meaning. For insiders the language is familiar and evokes a belief, for outsiders it sounds oddly dogmatic. The “us” versus “them” mindset pervades the piece. It smacks of conspiracy paranoia. After reading it through I noted that there were no actual facts or verifiable examples to support the writer’s assertions or speculation. It could not have been authored by Bennett or anyone else of his education and experience. Sure enough, a quick web search revealed that Snopes had discredited the item long ago. The PDF has live links to fact checking commentary. Bennett did not write it, and actually contradicted it in an interview. But most of you probably guessed that it was bogus without fact-checking or even finishing the article. Read about Skepticism Triggers here (click). I’ve been pondering the motivations of voters who rally around each of the candidates, as have most of the wonks in Washington. 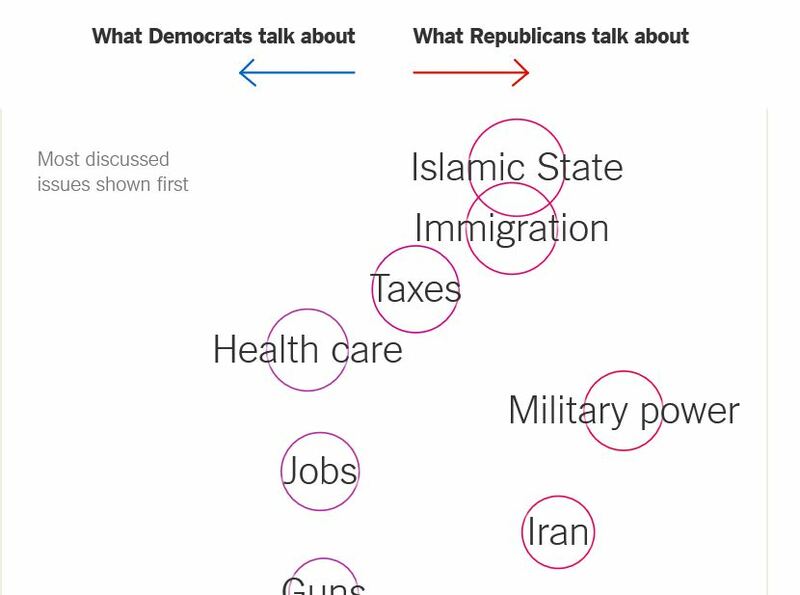 An article in the NY Times examined the things candidates talk about in the debates and presents a chart to illustrate the relative frequency each topic gets discussed. Take a moment and click on this link so you can see the whole graphic: Which Issues Each Party Debates, or Ignores. If you were asked to place the issues on the chart without seeing the article, I suspect you could replicate it by making the left side “visionary” issues and the right side “fearful” issues. I suppose I should not be surprised. Those who ardently believe that government should be smaller and do less, find it hard to come up with positive ideas for action that will muster voter support. Fear is powerful substitute for vision. The GOP has incited fear very effectively to manipulate elections. Newt Gingrich at the January 24, 2015 Conservative Freedom Summit set the stage for the present campaign with a veritable catalog of fear triggers the GOP could use. For those who see the nation as a community that looks out for one-another aided by government, big ideas and grand visions abound. Bernie Sanders, the democratic socialist, is widely faulted for espousing issues and ideas that are unworkable and might wreck the economy if attempted. Hillary Clinton is accused of being too pragmatic, and practicing the tepid politics of the possible. Trump’s authoritarian anti-establishment posturing plays to fears and resentments under a banner of “Make America Great Again,” an undefined goal that calls forth the sentiment that the establishment has disregarded and disrespected Americans with 1950’s values and sensibilities. It’s not so much a vision as a retro-fantasy about how things were once better. In a commentary in today’s NY Times Jacob Hacker and Paul Pierson argue that Hillary actually is visionary. Mrs. Clinton has put forth an ambitious and broadly popular policy agenda: family and medical leave, continued financial reform, improvements in the Affordable Care Act, investments in infrastructure and scientific research, measures to tackle global warming and improve air and water quality, and so on. But voters and pundits alike complain that she’s a cold-eyed realist who hasn’t articulated what George H. W. Bush once wistfully referred to as “the vision thing.” Instead, it’s Bernie Sanders who has been cast as the visionary in the Democratic contest, an idealist brimming with inspiring (if often unrealistic) proposals. The bulk of the article makes the historical case for government’s role in out national prosperity and individual well-being. It’s more about how the current political discourse ignores the facts of our past. In effect it implies that Hillary actually has the key to making America great, but keeps it hidden. Our nation badly needs a dialogue that reminds Americans why a capable government is essential and how much we are paying for its erosion. Mrs. Clinton understands this, but she may have neither the opportunity nor the inclination to say it. I think the authors are on to something. Take notes of what’s said. You’ll need them to report the scam. Give no information about yourself. If you have caller ID, enter the phone number into the search window of your web browser. There are several websites that provide reports on phone numbers that originate scams. I like Report The Call and 800Notes. If it’s a phony IRS call also report it here: www.tigta.gov. What if you think it’s a legitimate call but aren’t sure? Take down the caller’s name an phone number and offer to call back later. Go to the official website of the company or government agency and get the public phone number there so you are sure you are not calling an impostor. Call and ask for person who called you or explain that your are trying to validate a call you received. People working these scams will generally cut you off and hang up when they know you are suspicious. Legitimate callers don’t mind that you are being cautious. When I was a kid in high school sixty years ago the transistor had just been invented and transistor radios were a novelty. In 1960 when I graduated from the US Navy’s Electronics School they devoted only one week out of 28 to the transistor “because you might run across them someday” in the military gear we were being trained to maintain. It was only a year or so later that I was beginning to see transistors in super-secret cutting-edge gear. In 1966, working for Gates Radio Company, I was selling broadcast quality stereo sound mixers with all the glowing vacuum tubes replaced by tiny transistors. Yet our vacuum tube powered computer still filled an entire room and was controlled with stacks of IBM punch cards. There was a staff of several people that kept it running 24/7. A few years later in 1979, a young statistician working with me in my marketing research department at Sandoz began using the first Apple computer for survey tabulations, bypassing the company’s lethargic and bureaucratic IT department. We got better results faster and the move heralded the demise of the “big iron” computer for our sort of work. One guy with a spreadsheet program could do what had previously taken an organization of highly skilled people weeks to do. Today spreadsheets and word processors are standard personal computer applications. Now the latest “gee whiz” tools are vastly more sophisticated. For example, I can design and test complicated electronics gadgets using a four dollar app on my iPhone. Engineers at electronics design labs, using industrial versions of this software, can complete a design, test it and improve it in the simulator part of their software, and then submit the perfected design to the lab for fabrication. The working physical prototype device composed of thousands of tiny transistors and component parts is “printed” and delivered back to the design engineer in a matter of hours – virtually untouched by human hands. Dramatic, isn’t it? The computer went from being a mechanical toy to a ubiquitous tool for commerce and science. It truly is amazing. Various technology leaders have been following the trend that was born at the beginning of my career. It is accelerating fast, and it will continue to change the very nature of human vocations. Electronics technicians who actually work with soldering irons and components are a vanishing breed. Radio Shack is in bankruptcy. Amateur Radio is a vanishing hobby. Most electronics are disposable and it is hard to find a real TV repairman. The cable guy is a mechanic with little or no knowledge of how the wires and boxes he installs actually do their magic. A long-time friend and business colleague made a sweeping gesture toward a mostly vacant cluster of office cubicles saying, “See that? I don’t need half the people I once did. Nobody in my executive staff has a secretary.” He pulled out his smart phone. “Don’t need one. This does all that – appointments, meetings, mail, reminders.” Pausing, he shook his head and his voice became grave, “Don’t look back over your shoulder, there’s somebody who will do your job better, faster, and cheaper than you. For my friend, the smart phone was a tool but he could see the threat, and for the clerks and secretaries he once employed, it was a jarring career change. It was the 2007 recession that forced his downsizing, and technology filled the voids. That trend continues. I am a reasonably fast touch typist. I still prefer to compose at the keyboard, but I don’t have to. I can dictate my words onto “tape” or directly into my computer. The voice recognition software I use types faster, spells better, and is more accurate than I am. Only because I share an office with my wife, and the sound of my dictation distracts her, do I continue to type for myself. Clearly technology will continue to eliminate human jobs that involve repetitive routines or processes. In other work it will reduce the level of skill needed. In college I learned drafting with a pencil and T-square. I had to acquire the skill to visualize three dimensional objects in two dimensions, and to draw lines of various thickness and weight to visually represent them. Today, computer aided design or CAD has made the old butcher-block drawing board obsolete. I have another four dollar program on my phone that does excellent drafting, no manual skill required. I also have programs that let me create beautiful graphics with photos, illustrations, dramatic fonts, and render them as press-ready posters, banners, postcards, etc. I’m not a career commercial artist, but my hi-tech tools let me do professional level projects. And yes, the tools continue to evolve. Wozniac joins others like Gates, Jobs, Hawking, and Musk in this view. Ordinary work for people is becoming obsolete. The industrial revolution of the 19th and 20th century led to an era of leisure for the common individual in industrialized societies. A person could work a 40 hour week and have evenings and weekends free, enjoy paid holidays, vacations. Children didn’t need to work to help support the family. Where once only the rich had time for education and the arts, a large middle class gained access to affluent lifestyles. Will human creativity be immune to the relentless assault on human vocations? Maybe not. Consider the musician’s new tools. Electronic synthesizers allow a person with piano keyboard talent to simulate a huge repertoire of instruments. Percussion, strings, woodwinds, brass, as well as other-worldly electronic tones are all available. He or she can create and save a continuous loop of sound to produce the background rhythm of drums, then add another loop or two that supplies the bass beat, and then improvise a melody. The “one man band” has come a long way in recent years. Barbara Streisand, with four talented musicians using these tools produced the sound of a full orchestra and simulated the acoustics of a great concert hall – all in the coziness of her home garden. And yes, similar music tools are all on my iPad. I have no musical training at all, but I can craft New Age sounds and harmonies by drawing patterns on my touch screen computer. With little effort except to discern what sounds good to me, I can make music, save it, and play it back at will. Yes, the computer can render my humble effort as a printed musical score, even though I can’t read it. If I write lyrics, it will translate into any of several languages as well. How much of a leap will it be for a computer to anticipate what will sound good, and generate original music and arrangements? It is easy to imagine that computers could analyze the elements of the most popular music, determine what is most likely to please, and generate new tunes. The internet has not only enabled us to instantly communicate with far flung networks of friends, but it has also allowed networks of machines to communicate and coordinate with each other and become the Internet of Things (IoT). These networks are ubiquitous and largely invisible to the average person. I’ll point out a few. We already have cars that can parallel park themselves better that most humans. Google and others have been experimenting with self-driving cars with considerable success. But unlike aircraft, the auto must deal with road hazards: debris, potholes, animals, children and other pedestrians, rain, snow, ice, and impaired human drivers. They will also have to win the confidence of human passengers and government regulators. Yet autos already have some advantages with more to come. The anti-lock brakes (ABS) on virtually all current models of cars can stop a car faster than even an experienced race driver because ABS applies the maximum stopping traction to each individual wheel, automatically adjusting for changes in traction due to road surface. The race driver must apply pedal pressure just short of locking the wheels. Often one wheel locks briefly despite skillful braking. On an eighteen wheel semi, no amount of driver skill can prevent lockup. ABS reacts faster and is more adaptive than humans can be. We can now buy systems for cars that warn when we are closing on another vehicle or obstruction too fast. But before long cars will be equipped with wireless networking that will power an ad-hoc network in which each vehicle can be aware of the location, speed and direction of its neighbors on the road. Such a network would allow the auto to “see” around corners, over hills, and through rain and fog. It’s easy to imagine that these smart cars could also communicate with the traffic signals and a highway network to allow traffic to synchronize speed taking into account conditions not yet visible. In such a system, vehicles could move like a flock of birds in close formation without danger of the sort of pileup collisions seen on today’s freeways. The day may be coming when it’s not legal to pilot your own car on high speed roadways. I never visit my bank. It’s in San Antonio, Texas and I live in Newtown, Pennsylvania. If I want to deposit a check, I snap a picture with my phone, select the account, enter the amount and the bank reads digital codes on the check image, and credits my account. Somewhere in the process a human must view the image to verify the amount, but even that may soon be automated. Machines communicate with each other to make these transactions possible: my phone sends data over the internet to my bank’s computer and the bank authenticates me and my phone. Then the phone interacts with the bank computer to validate the check image as readable. Finally the banks computer acknowledges the transaction to my phone and the phone displays the new balance. I can pay bills in much the same way. My bank in turn uses the Automated Clearing House (ACH) network to process the check with the issuing bank and move the funds. All of this is machine talking to machine. Actually the forgoing examples are not artificial intelligence; maybe we could call them artificial skill systems. Intelligence implies the capacity to learn, create and adapt – that is to think autonomously. The capacity to transfer learning by language, to anticipate, and to adapt ourselves proactively sets us apart from other life forms and from the machines we have thus far created. Frankly, we have a lot to learn about how our human brain and nervous system works to enable us to think. Pure logic and analysis alone do not suffice. Humans who lack compassion and emotional affect are regarded as psychopaths – deficient in qualities essential to socialization. Leonard Nemoy in Startrek, was a character who functioned rationally lacking the human emotions of his crew mates. The Doc Martin character, of the British TV comedy, seemed to lack the ability to fully experience or express emotions – a flaw that is the source for the hilarious situations that have entertained viewers for several seasons. These two fictional personalities dramatize the huge difference between he purely analytical/logical and actual human thought. That’s not to say humans can’t be fooled by machines. In June 2014 a computer dubbed with the name Eugene Goostman succeeded in passing the Turing test by fooling more that 30% of the humans who interacted with it into thinking it was a human. Technology and the Internet have evolved to assemble, organize and retain knowledge. But can’t (yet) synthesize new facts and theories. It has evolved to execute complex processes including many that once required skilled human craftsmen. The graphical user interface (GUI) combined with voice recognition allows humans to interact directly, as if with another human. A familiar example is Siri, the iPhone application that interprets human speech to look up information and execute requests. If you ask Siri, “Do you love me?” she responds, “I respect you.” It’s the programmer’s sense of humor, not the computer’s. Even Siri is not intelligence, it’s just another human to machine interface. Scientists are experimenting with machines that mimic neural networks and it looks like they will succeed. Indeed there is a branch of statistics, Artificial Neural Networks or ANNs, that is inspired by biological neural networks. This science is applied in creating the computer software that powers voice and image recognition systems. ANNs will be the fundamental building block for genuine artificial intelligence. When such networks can autonomously adapt themselves and self-replicate to extend and enhance their functions, then the dividing line between biological and mechanical intelligence will begin to blur. Just this week Amazon announced the availability of a product for software developers that makes AI tools for machine learning affordable. If we now have excellent voice recognition systems, reliable image and fingerprint recognition, and computers that can fool people in conversation, is it so hard to imagine genuine artificial intelligence? A newly released film, Ex Machina, contemplates the consequences of simulating a flesh and blood woman named Ava. She, another recent film contemplates a computer operating system that so realistically simulates human behavior that its owner falls in love with it after naming it Samantha. that will not only add, subtract, multiply and divide, but also graph functions such as quadratic equations. Applications can be added to one’s smart phone that do these things and more. The ubiquitous spread sheet software “Excel” includes the most sophisticated business and scientific formulas, and templates are available for such common tasks as calculating mortgage amortizations. You no longer need to know how to do these things, you just need to know how to find the software that does it for you. Our machines are making us lazier if not actually dumber. My daughter, when she was a teen, worked at a fast food restaurant twenty years ago. She quickly became the cashier for her shift because she knew how to count out the change. Today, the register calculates and prints the amount of change for cash transactions, but increasing numbers of customers just swipe their credit/debit cards. No employee needs to know how to make change. Some businesses must shut down if the computers aren’t working because there is no way to transact a sale without them. Cursive writing is not taught in many elementary schools. In a business world of keyboards, email, phone texting, and voice recognition, who needs to write fast manually? Indeed, we are instructed to print when filling out paper forms. Do kids still learn to tie shoes in the age of Velcro? Firemen, sailors, and boy scouts once learned basic knots. No more. Firefighters are taught only the figure eight knot today because it is almost impossible to tie wrong. The fact that the knots don’t come out easily doesn’t matter. Ropes are replaced after a single fire scene use to prevent failure due to concealed damage, and special fittings and tools make knot tying unnecessary. Like knitting, machines have made knots a hobby skill. Clearly many of the skills that are basic to self-sufficiency are vanishing. Few people today have the ability to service their own cars, sew clothes, or maintain their home appliances. One needs a specialized computer to diagnose problems, and “repairs” are commonly replacement of a modular component unique to the product. Though our appliances are remarkably reliable, with service lives of ten years or more, we often opt to replace them when they brake. A single repair can cost 30% of the “new” item’s price. Competent technicians bill at labor rates of $100 an hour, and charge for travel time. “Last month’s Automate 2015, which organizers bill as the largest showcase of automation technologies in North America, signaled a change in the wind for light manufacturing. There are two obvious trends here: Machines are getting better and cheaper, and ordinary people are not only becoming dependent, but they are being replaced in the workplace. What hope of gainful employment does a kid have if he possesses only limited manual skills, no math, and a stunted ability learn because of poor skills at reading, writing, and analytical thinking? Granted, personal services and creative careers are not easily automated. None of today’s robots can compete with a caring health aid, or social worker. People like fine dining and the luxury of personal service. Except for speed and convenience, we don’t like vending machines or even cafeterias. The Automat of the early 1900’s is a novelty today. It didn’t really automate food preparation, it just mechanized self-service. Wages in service jobs have been stagnant for decades when adjusted for inflation. Most do not pay enough to support a family without some supplementary income from a spouse or a second job. It’s not likely that the service sector is going to expand to replace the vanishing manufacturing jobs. In the more skilled tiers of technicians and mechanics who support machines, the trend is toward fewer people, and more highly trained people. I have a friend who has made a good living as a diesel locomotive mechanic. Most of the maintenance and repair work on these mammoth machines is done at depots specially equipped for it. A “dead” locomotive can usually be towed to the depot where specialists work on it in a more factory-like setting. My friend is one of the few generalist mechanics who travels afield to the equipment. Unlike many of his peers, he understands locomotives, he works autonomously, improvises temporary repairs, and does whatever it takes to “get her rolling.” There aren’t many like him. Another friend services commercial kitchen equipment. He’s well past retirement age and he laments that few of his younger protégés seem to have the “common sense” to figure out what’s not working and repair it. If the fault isn’t a visually obvious burnt or broken part he says they are stumped. Where do we learn such common sense? My generation tinkered. Boys like me made soap box cars out of salvaged wheels from baby strollers. We took apart broken clocks to see what made them work. We built tree forts, and rafts hammering our thumbs more than once as we learned to use tools. We serviced the lawn mower, or a moped, and thus learned about engines. We had erector sets and built stuff. We became good with our hands and inventive with our minds. Many of today’s kids spend most of each day in programmed activities mostly for school and sports. Idle time, such as there is, is spent on entertainments like video games, facebook, youtube, etc. None of these activities demand autonomous self-directed effort, nor do they require much innovation or creativity. They are formulistic or reactive. In the workplace, jobs that require doing just what one is told pay less than those that require one to be a self-starter who figures out how to do the task at hand. Indeed the formulistic and routine jobs are exactly the jobs that presently are most easily automated. Meanwhile, if anybody can do the job with minimal training, there will be lots of job candidates. When supply exceeds demand, there is no incentive to raise wages above minimum. Jobs that require one to recognize and prioritize what’s to be done pay better because they require original thinking and judgment. These jobs are less easy to automate. And jobs that require one to invent original solutions can’t yet be automated. As automation marches on, where will the young people who can’t or won’t think creatively find work? We already have large numbers of poorly educated urban poor, and it looks like there will be fewer and fewer good paying jobs for the ordinary Joe with no special skills or knowledge. The picture of ever larger numbers of ignorant people with poor employment prospects, people who are discouraged, hopeless and angry, is chilling. It takes about 16 school-years to achieve the necessary educational foundation for the good jobs of the future. It takes spiritual and personal maturity to imbue a person with the attitudes that make for success. If a kid blows off the opportunity for a public education and arrives at the age of 18 barely able to read, the path to personal success is steep indeed. United Parcel Service (UPS) uses a network of computer systems to track the movement of each package from source to destination. The massive amount of data they have for every part of the logistics process allows them to establish norms for performance. Those little brown computer clipboards the drivers carry “know” just how long it should take to deliver every item. If a driver’s performance slips, he will find a supervisor with a clipboard riding in the cab with him to observe every move. He can lose his job if he can’t meet the norms. Obviously, as the poorer than average performers at the bottom of the bell curve are eliminated, the norms move relentlessly higher. Amazon uses similar technology to evaluate warehouse workers. Fast food restaurants, automotive service shops, and countless other employers are able to measure individual performance against such norms. Even the medical profession has data to track the “productivity” of clinic doctors. It is not an artifact of some dystopian future, the work that is uniquely human is being expedited by dispassionate machines here and now. This essay has highlighted present-day technology that is converging toward machines that think. These machine will not only reason, but will employ brain-like networks to do non-linear processes that emulate the creative and innovative processes of humans. The day is at hand when people can’t discern when they are interacting directly with a machine and not another human. I’m 75 and don’t expect to live to see the first computer that is truly indistinguishable in its thinking from a living person. But I’m confident that my grandchildren will witness the phenomenon. Those sentient computers will also be networked with others. Unlike their human progenitors, they will have few, if any, communication failures, personality clashes, emotions, and guileful deceptions. They will have access to huge amounts of information. They will process that data at speeds that will be even more awesome than today’s terabyte triumphs. Humans may become the least reliable, and most non-essential part of the process. So if devices with artificial intelligence are smarter, faster, less error prone, incorruptible, tireless, immortal, and capable of emulating humans in all important intellectual ways, will they acquire souls? Will they become autonomous beings with values and purposes humans did not program? Will it be unethical to pull the plug? A group of inventors, seeking to build a robot that could safely search the rubble of collapsed buildings for survivors have begun to study ways to make a bio-mechanical hybrid. Somebody hit upon the idea of equipping a large roach with a kind of backpack containing electronics that would control it as a human rider does a horse. They found it surprisingly easy and created a working prototype with materials available at the local hobby store. I couldn’t help comparing the remote controlled roach to a hapless UPS driver as I watched the Youtube video. The Trans Pacific Partnership (TPP) is supported by large multinational corporations and feared by many progressives. Although details of the complex document are supposed to be classified and not available to the press, Wikileaks has obtained portions and the NY Times and others are now able to report on some of the provisions. NY Times: Trans Pacific Partnership Seenas Door to Foreign Suits against U.S.
All the wrong people seem to like TPP. The fear mongers are telling us we should worry about China if it doesn’t pass, the progressives say it will cost jobs and give too much power to big multinational corporations. Much of the opinion is speculation because details are secret. Plus, the administration is trying to fast-track it, presumably because if everyone has time to think about it they are sure to find stuff they don’t like and will endlessly debate and bicker over it. I guess we just “stay tuned” and keep a watchful eye for informed opinion. New Yorker Magazine writer Alexandra Schwartz at first questioned, as may of us did, Monica Lewenski’s premise that cyber bullying represents a deficiency of compassion. But her article takes you through her own process of coming to appreciate what Ms. Lewinski is saying. Personally, I think the deficiency is far more pervasive, and is certainly not limited to the internet. Recent headlines have told of the excesses of college fraternities and many of the comments by those involved have revealed an astounding ignorance of what has made their exploits so sensational. From inside their self-centered world view they fail to see the problem. If such attitudes are the norm among tribes of fraternity brothers at Ivy League colleges, is it any wonder that in later life they become CEOs and Investment Bankers who see no problem in dismissing social and societal damage as “externalities?” Should we be surprised that they have no shame about gaming the political system by essentially bribing politicians with campaign support? I suggest that we are living in an addictive, psychopathic society that has perverted the ideals of democracy. Our lack of compassion for large segments of our citizenry both present and future accounts for our lack of stewardship for the planet, and for the health of our own society. Could the rise of right and left-wing extremist groups, fundamentalist cults, and other aberrations be a consequence of narcissistic Americans dismissing compassion as wimpy and naive? If not psychopathic, how do you explain the opportunistic political exploitation of these wing-nuts? Monica Lewinski is pointing to just one of the many glaring examples that support my assertion. God Bless Save America!